A passion for own creativity, Ramalinga Village Resort is greatly built. A private fully furnished individual villas perfectly suit all kinds of travelers. This place is designed for all kinds of fun, and leisure. Each Villa includes an air-conditioning, living room, bedroom and a bathroom with Open showers, to make you feel relaxed on your holidays. We provide several standard amenities including a complimentary breakfast for added ease and utility for the guests. The villa accommodates 2 people and is ideal for the getaway. Our villas ensure comfort, safety and an assured level of service. 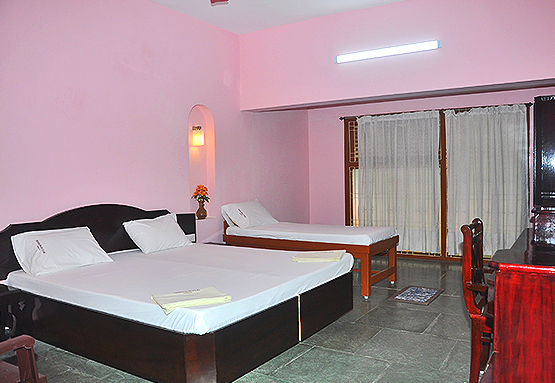 The serene place makes you feel comfortable and relaxed, which you definitely want on your holidays. Just book a villa and relax, we will create it as the way you want it to be.